Zond 5 (Russian: Зонд 5), one of the satellites of the Soviet Zond program, was the spacecraft that in September 1968 became the second ship to travel to and circle the Moon, and the first to return safely to Earth. Zond 5 carried the first Earthlings to reach the Moon, including two tortoises, fruit fly eggs, and plants; these Moon travelers were returned safely to Earth. 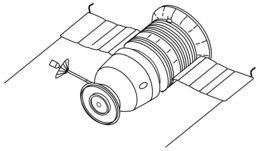 The Zond spacecraft was a version of the Soyuz 7K-L1 crewed lunar-flyby spacecraft. It was launched by a Proton-K carrier rocket with a Blok D upper stage to conduct scientific studies during its lunar flyby. The tortoises underwent biological changes during the flight, but it was concluded that the changes were primarily due to starvation, and minorly influenced by space travel. Out of four circumlunar launches, the Soviets had one partial success, Zond 4, and three failures. After Zond 4's mission in March 1968, a follow-up, Zond 1968A, was launched on 23 April. The launch failed however when the LES sent an erroneous abort command at T+260 seconds and shut down the Proton booster's second stage. The escape rocket fired and pulled the descent module to safety. In July, Zond 1968B was being prepared for launch when the Block D stage exploded on the pad, killing three people, but leaving the Proton booster and spacecraft with only minor damage. The Zond 5 mission was originally planned to fly cosmonauts around the Moon, but the failures of Zond 1968A and Zond 1968B caused the Soviets to launch another uncrewed mission. Two Russian tortoises were included in the biological payload, weighing 0.34–0.4 kg pre-flight. Soviet scientists chose tortoises since they were easy to tightly secure. There were also two tortoises used as control specimen and four more that lived in a vivarium. Twelve days before launch, the two space-bound tortoises were secured in the vehicle and deprived of food and water. The control tortoises were also deprived of food and water. The food deprivation was a part of pathomorphological and histochemical experiments. The biological payload also included fruit fly eggs, cells of wheat, barley, pea, pine, carrots and tomatoes, tradescantia paludosa, three strains of chlorella, and one strain of lysogenic bacteria. The purpose of sending the Earthlings was to test the effect of radiation on the specimen. The Russian Academy of Sciences said there was a mannequin in the pilot's seat equipped with radiation sensors. Zond 5 contained proton detectors. The spacecraft also had the ability to image the Earth. Kazan Optical and Mechanical Plant (KOMZ) developed the AFA-BA/40 imager, which was installed on the spacecraft. Zond 5 could store data onboard and transmit some back to ground stations via radio waves. An advantage is that data recorded on the spacecraft has less noise than data transmitted to Earth. Zond 5 launched on 14 September, 9:42.10 UTC from Site 81 at the Baikonur Cosmodrome. Thrust of the third stage was terminated at 160 km, which was the start of a 251 second coast. Blok D (the upper stage) ignited and burned for 108 seconds, placing the spacecraft into a parking orbit of 191×219 km. Fifty-six minutes into the parking orbit the Blok D fired a final time for the trans-lunar injection (TLI) burn. After this maneuver, the launch was announced to the world. Mission Control discovered issues with Zond 5's attitude and traced the issue to a contaminated star tracker. Heat caused some of the interior coating to offgas. This delayed an attitude correction on its trip to the Moon. The maneuver was performed 325,000 km from Earth using the Sun and the Earth as reference points. On 18 September, the spacecraft flew around the Moon, although it did not orbit it. The closest distance was 1,950 kilometres (1,210 mi). On the way back from the Moon, another star tracker failed. The spacecraft also erroneously switched off the guided reentry system. The Soviet government deployed eight ships to the Indian Ocean prior to the launch in case the spacecraft could not reach Soviet territory; only three of them had rescue helicopters onboard. On 21 September, the reentry capsule entered the Earth's atmosphere. Landing was supposed to occur in Kazakhstan, but instead Zond 5 splashed down in the Indian Ocean and was recovered by the Soviet vessels Borovichy and Vasiliy Golovin. It landed at -32°38' longitude and 65°33' latitude, 105 kilometres (65 mi) from the nearest Soviet naval ship. The landing occurred at night, which impaired recovery efforts. Zond 5 became the first spacecraft to circle the Moon and return to land on Earth. Although the ballistic reentry would have been bad for human occupants, it did not appear to affect the biological specimens, all of which were alive and well when the descent module was finally opened four days after landing. The USS McMorris was shadowing the Soviet recovery ships, collecting intelligence. The US ship left soon after the spacecraft was brought on board the Soviet ship. High-quality photographs of the Earth, the first photos of its kind, were taken at a distance of 90,000 kilometres (56,000 mi). British astronomer Bernard Lovell, considered Britain's top space expert, said that the Zond 5 mission showed the Soviets were ahead in the Space Race. The British Interplanetary Society believed that the USSR would be able to send cosmonauts around the Moon in a matter of months. In October 1968, sources in the U.S. claimed the mission was not as successful as the Soviets advertised. The mission was intended to fly closer to the Moon, and the altitude it was at did not allow for useful photography. They also said that the angle at which the spacecraft reentered the atmosphere was too steep, which would have killed a cosmonaut. The sources also indicated that the spacecraft landed in the Indian Ocean when the planned location was in Russian territory, which was a factor in the long 10-hour recovery time. TASS announced that the flight carried Earthlings in November 1968. The tortoises were dissected on 11 October after fasting for 39 days. The flying tortoises, identified as No. 22 and No. 37, lost ten percent of their body weight from the trip, but showed no loss of appetite. The control tortoises lost 5% of their weight. Blood analysis between the space-travelling tortoises and the control specimens that stayed on Earth revealed no differences. Another analysis showed the flying tortoises had elevated iron and glycogen levels in their liver and affected the shape of their spleen. The authors concluded that the changes in the flight tortoises were primarily due to starvation, and minorly influenced by space travel. Also in November 1968, it was announced that the spacecraft was planned as a precursor to a crewed lunar spacecraft. The Soviets made this announcement a month before the planned Apollo 8 flight, in an attempt to show they were close to a crewed trip to the Moon. The Zond 5 return capsule is on display at the RKK Energiya museum, located near Korolyov, Moscow Oblast. ^ a b c d e "Zond 5". NASA Space Science Data Coordinated Archive. Retrieved 28 February 2019. ^ Siddiqi 2003, p. 653. ^ "Tentatively Identified Missions and Launch Failures". NASA Space Science Data Coordinated Archive. Retrieved 9 March 2019. ^ Zak, Anatoly. "Mission L1 No. 8L: A deadly accident". Russian Space Web. Retrieved 9 March 2019. ^ a b c d e Zak, Anatoly. "Zond 5". Russian Space Web. Retrieved 9 March 2019. ^ Gaidamakin et al. 1969, p. 2. ^ a b c Siddiqi 2003, p. 654. ^ a b Madigral, Alexis C. (27 December 2012). "Who Was First in the Race to the Moon? The Tortoise". Atlantic. Retrieved 9 March 2019. ^ a b Bausman, John (15 November 1968). "Turtles, Flies Circle the Moon". The Journal News. White Plains, New York. Associated Press. p. 24 – via Newspapers.com. ^ "Proton Detectors". NASA Space Science Data Coordinated Archive. Retrieved 28 February 2019. ^ "Earth-Cloud Photography". NASA Space Science Data Coordinated Archive. Retrieved 28 February 2019. ^ "Space Recordings Returned by Zond 5". The New York Times. 24 September 1968. p. 41. ^ a b Siddiqi 2003, p. 655. ^ Siddiqi 2003, pp. 655–656. ^ Cassutt 2007, p. 320. ^ "Zond 5, Landing Point, Miss Distance". NASA. Archived from the original on 27 September 2011. ^ a b Siddiqi 2003, p. 656. ^ Day, Dwayne A. (9 February 2009). "Chasing the Zond". The Space Review. Retrieved 9 March 2019. ^ "ENERGIA's driving force". ENERGIA. Retrieved 9 March 2019. ^ "Russ Lead in Race to the Moon Top British Space Expert Says". Arizona Republic. Phoenix, Arizona. Associated Press. 23 September 1968. p. 6 – via Newspapers.com. ^ Bloom, Mark (1 October 1968). "Flight of Russian Moonship Called Blow to its Program". Daily News. New York, New York. p. 5 – via Newspapers.com. ^ Gaidamakin et al. 1969, p. 1. ^ Gaidamakin et al. 1969, p. 3. ^ "Soviets Recover Spacecraft After Flight Around Moon Opens Way for a Manned Shot". The Morning Call. Allentown, Pennsylvania. New York Times News Service. 23 September 1968. p. 3 – via Newspapers.com. ^ "Soviets Reveal Moonflight Probes Foretell Real Trip". Clarion-Ledger. Jackson, Mississippi. Associated Press. 25 November 1968. p. 34 – via Newspapers.com. ^ "Russia: Location of Russian Manned Spacecraft". Astronautix. Retrieved 19 August 2018. Cassutt, Michael (2007). Red Moon. Tom Doherty Associates. ISBN 978-1-4299-7172-0. Gaidamakin, N. A.; Parfenov, G. P.; Petrukhin, V. G.; Antipov, V. V.; Saksonov, P. P.; Smirvona, A. V. (1969). Zug, George R.; Peters, James A. (eds.). Патоморфологические и гистохимические изменения в органах черепах на борту космического корабля «Зонд-5» [Patho-Morphological and Histochemical Changes in the Organs of Turtles on Board the "Zond-5" Probe] (PDF). 18th IAF Conference (in Russian). Translated by Friedman, Morris D. La Plata, Argentina. Siddiqi, Asif A. (2003) . The Soviet Space Race with Apollo. Gainesville, Florida: University Press of Florida. ISBN 978-0-8130-2628-2.